I’ve already discussed the constant invasion attempts of the former Nome King, but this time I’d like to take a closer look at the individual attempts. The first occurs in The Emerald City of Oz, in which King Roquat’s goal is to regain the Magic Belt that had been taken from him by Dorothy, and get revenge on the Ozites. His subjects dig a tunnel under the Deadly Desert in order to reach the Land of Oz, and he and General Guph make uneasy allies of the Whimsies, Growleywogs, and Phanfasms. They plan to lay waste to Oz, but it just so happens that the tunnel ends right at the memory-erasing Forbidden Fountain, and the Scarecrow had the idea for Ozma to fill the tunnel with dust. 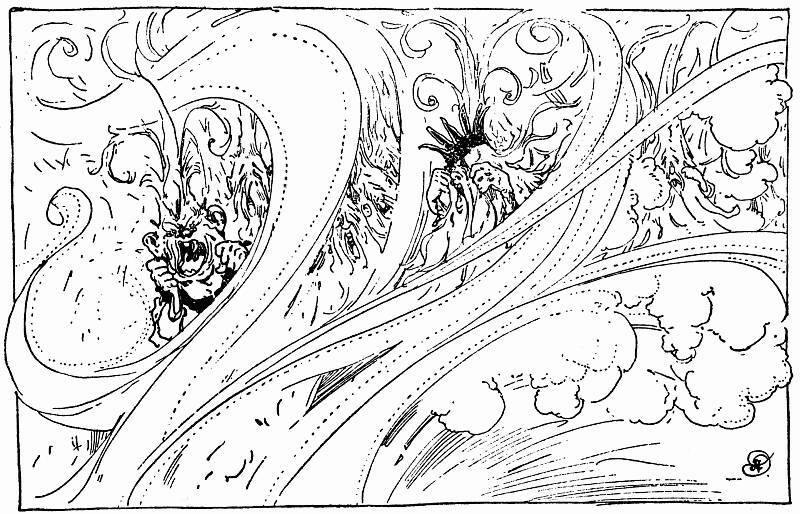 So the invaders drink from the fountain and lose their memories, and Ozma sends them back home and closes up the tunnel. Well, at least that’s what this book says. 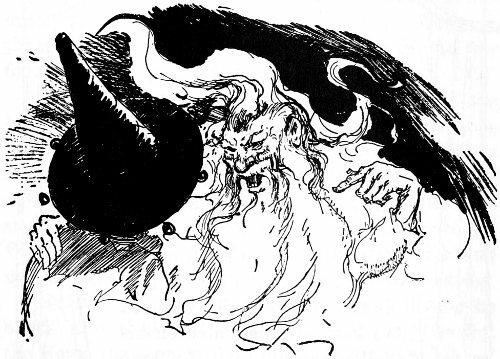 L. Frank Baum informs us that “Ozma used the Magic Belt to close up the tunnel, so that the earth underneath the desert sands became as solid as it was before the Nomes began to dig,” yet the tunnel is back again in Jack Snow’s Shaggy Man. The next invasion attempt by the Nome occurs in Magic, and by this time his name is Ruggedo and he is no longer the king. He is merely wandering around Ev until he meets up with Kiki Aru, who knows a magic word of transformation. Ruggedo convinces Kiki to help him conquer Oz, claiming that he will return to his own kingdom once the Hyup is established as king, although we never know how sincere the Nome is in this claim. His idea is that he and Kiki should take the forms of animals, so that they would not be detected by Glinda’s Great Book of Records. Wait, hold on a minute. When have we ever known the Book not to record the deeds of animals? In Rinkitink, Dorothy uses it to read about the adventures of Prince Inga and his companions, including Bilbil the goat. Later, in Ruth Plumly Thompson’s Cowardly Lion, it mentions the title character. And even if Ruggedo were right about this, how would he know? Reports by spies? This element of the story never really worked for me, and it seems fairly integral to the plot, because otherwise why involve the animals of the Forest of Gugu at all? Wouldn’t it have been quicker and easier to just fly to the Emerald City and transform everyone into inanimate objects? Instead, we get the complicated scheme of convincing the animals to rebel, with the intention of turning the people of Oz into beasts and the beasts into humans. They never get all that far in this plot, though, not only because of a lack of trust among the co-conspirators, but also because the Wizard of Oz overhears the Magic Word and takes down the troublemakers quite easily. We never do learn whether any of this made into into Glinda’s Record Book. That’s it as far as Nome invasions in the Baum books, but Thompson returns to this idea several times. In Kabumpo, Ruggedo doesn’t really have a plan, and is just haphazardly constructing secret passages and stealing things. 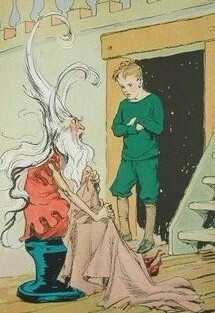 When he discovers Glegg’s Box of Mixed Magic, he experiments with it, but that only results in his ending up a giant with Ozma’s palace stuck to his head. After he and the palace are both restored, the former Nome King is banished to a desert island. 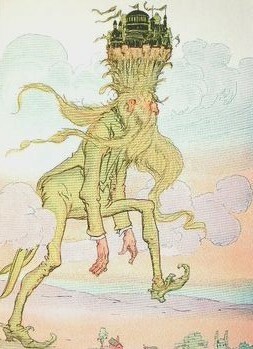 In Gnome King, he manages to escape it in a seaquake, regain the crown of the Nome Kingdom from Kaliko, and find a Flying Cloak of Invisibility that he uses to travel to the Emerald City. His plan is to steal the Magic Belt from Ozma, but as she is out of town when he arrives, he occupies his time tormenting her friends. When he finally does manage to take the Belt, Peter Brown hits him in the head with the Silence Stone, which just happened to have been in the same casket as the cloak. In both of these books, Ruggedo pretty much just uses materials that he comes across, and isn’t as much of a planner as he was in his first two conquest attempts. In Pirates, Ruggedo’s scheme is a little more detailed. He finds an ally in Clocker, the Wise Man of Menankypoo, who provides advice and has access to various magical tools made by Kadj the Conjurer and his daughter Cinderbutton. He also raises a small army of pirates and Octagonese rebels, and trains them to fight. I do think, however, that Thompson kind of ran out of steam toward the end of the plot, as is not uncommon for her. Clocker has a Way-Word that lets the army cross the desert, and then they march to the Emerald City, and quickly conquer the peaceful inhabitants. Ruggedo then sneaks into the palace, steals the Magic Belt, and uses it to dispose of his army and transform a few of the Ozites. You’d think it wouldn’t be that easy to sneak in after the pirates had just caused mayhem in the city. Ozma and her court are busy choosing a ruler for a new kingdom, however, and Thompson reports that the Nome was “hidden from view from some of the conjurer’s magic.” It would have been nice to get a little more detail on this point. The Clock Man uses the Standing-Stick to freeze everyone in the throne room in place, but is taken out of commission when Pigasus shows up and swallows his cuckoo bird. Ruggedo quickly grabs the Stick himself, but is stopped by Captain Salt, who bursts in and grabs him. I suppose this means the Stick only works on anyone in front of its bearer, but if that’s the case, then couldn’t anyone have done what the captain did? I don’t think everyone in the palace was in the throne room at the time, so it seems like it could just as easily have been a random footman who saved the day. Or is there something in how Rug held the Stick that made it less effective? After all, Clocker was the one who really knew how it worked. It seems like a brief mention of this would have sufficed, but these books apparently received next to no editing. The former Nome King makes one more canonical appearance, and that’s in Handy Mandy. The Goat Girl inadvertently turns Ruggedo back from a jug, and he teams up with the Wizard of Wutz to steal Ozma’s most powerful magic. As with some of these other attempts, the problem really comes in when the Nome argues with his partner, giving a protagonist (in this case Mandy herself) time to stop them. Rug and his allies not trusting each other is a constant theme in these stories. Even when they never actually have a chance to betray him, we’re usually told that they want to. And it’s not like the Nome isn’t wise to this fact; he generally plans to betray them himself when he’s met his goals. I suppose there’s a theme here that, if you’re not trustworthy yourself, you don’t trust anyone else either. Then again, I think I’m fairly trustworthy and I don’t really trust other people. I do think there’s a clear point here, though; the “enemy of my enemy is my friend” idea never really works out, in real life any more than it does in books. This entry was posted in Characters, Magic Items, Oz and tagged bilbil, captain salt, cinderbutton the witch, clocker, cowardly lion, flying cloak of invisibility, forbidden fountain, forest of gugu, general guph, glegg's box of mixed magic, great book of records, growleywogs, handy mandy, hany mandy in oz, jack snow, kabumpo in oz, kadj the conjurer, kiki aru, l. frank baum, magic belt, nome king, nomes, ozma, peter brown, phanfasms, pigasus, pirates in oz, prince inga of pingaree, pyrzqxgl, ruth plumly thompson, scarecrow, silence stone, standing-stick, the cowardly lion of oz, the emerald city of oz, the gnome king of oz, the magic of oz, the shaggy man of oz, whimsies, wizard of wutz. Bookmark the permalink. I think the first attempt is the most interesting. The Nome King makes a dandy stand in for Hades and one can encode “Ozma of Oz” as a retelling of the myth of Theseus (I wrote my Mythology term paper on just this subject, and would like to tidy it up and submit it to the bugle). Emerald City strengthens this association… compare and contrast the concept of a tunnel leading from the Nome King’s underground kingdom to the Forbidden Foutain to the River Lethe mentioned in virgil. 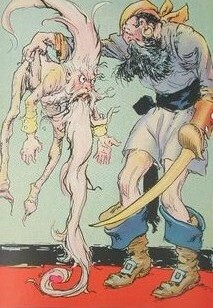 I think the Nome King is quite likely based on Hades, even if the connection wasn’t conscious on Baum’s part. Don’t forget that Hades is guarded by a three-headed dog, and the Nomes apparently have seven-headed dogs. I don’t remember the 7 headed dog bit, where was that? I will so use that when I revise my essay. And I agree the Nome King is Hades, first of all being lord over Material wealth and possesions was part of Hades’ stick too (anything associated with underground was connected to Hades). And the prisoners he turned into ornaments… well that’s a type of lifelessness.. The seven-headed dogs are mentioned in Emerald City. Roquat orders his guards to have Crinkle sliced up and fed to the seven-headed dogs. I don’t really get, and I don’t think I ever got this, why a cloud of dust in the crowded tunnel would cause them to be thirsty and that’s it. I would actually imagine them to be running to wash the dust out of their eyes and ears. And…weren’t the Whimsies really wearing masks/fake heads? So shouldn’t they have protection from the dust getting in their mouths? I think if Ozma just wanted to make them thirsty, she could have wished drying their mouths up or making them sweat profusely. Maybe the Magic Belt only works on things that actually exist and can be manipulated, rather than creating things from nowhere. Well, the Whimsies must have had mouth-holes in order to speak without sounding totally muffled, right? Still, I see your point. I’m also not sure why the Phanfasms couldn’t change form to something that wasn’t bothered to dust. The Phanfasms weren’t shapeshifters, they were illusion-casters. I guess it was never entirely clear whether the Phanfasms’ alternate forms were real or not. Unlike the Mimics, however, they apparently couldn’t just turn into birds and fly to the Emerald City.